What is the cost of promoting your app? 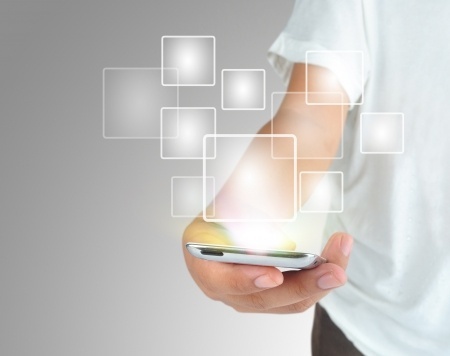 At InMobi we work with thousands of developers and host app promotion campaigns on our network. In an effort to understand app download and purchase trends worldwide,we analyzed all the campaigns in Q2 2013 that ran on our network. After thorough number-crunching and analysis we arrived at some valuable insights on how you can really drive downloads to your app and make your product stand out in the crowded app ecosystem. Before charting out a marketing budget, publishers usually estimate what their user’s Lifetime Value (LTV) will be. This is a key metric because it determines how loyal a user is going to be to your app and how much he will spend on it. The more loyal and dependant on the app the user is, the more he/she is willing to spend on it. Deciding this metric also will give you an indication as to how much you should spend on acquiring users. This is where you will come across Cost Per Install (CPI). The CPI of your app is a measure of how much you would pay to get a legitimate download of your app. This varies from on what kind of app it is and also on the country you are targeting. Indexed against the costs in the US, our research indicates that driving a download in most markets, especially in China, Japan and Korea is relatively cheaper in comparison to the US markets. The UK and Australia data points represent the more expensive markets. India ranks as the least expensive market for app downloads. Cost per downloads (or CPDs) vary drastically by the type of content promoted and depend on the estimated lifetime value (LTV) of the app’s user. 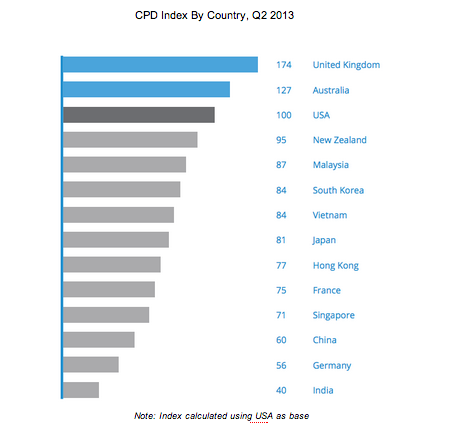 The higher the LTV, the higher the CPD tends to be. For example, a travel app developer is usually willing to pay much more to acquire a user, compared to the average game developer, since the expected revenues from a loyal user can be much higher. The following chart reflects the average CPDs we notice on our network. 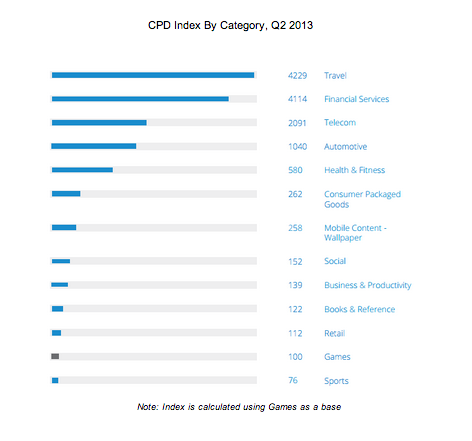 Travel and financial service apps top the charts on CPD bids on the network; games and sports apps round out the bottom end of the index. Depending on what your app is and where you intend to drive installs, you should gauge your CPI and decide on an app marketing strategy accordingly. For additional useful information and tips about app monetization, have a look at our App Insight Report.